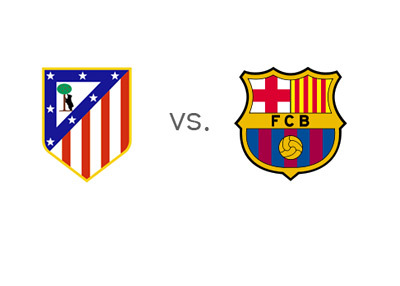 A massive game between second place Atletico Madrid and first place Barcelona is set to be played on Saturday, January 11th, 2014 in the nineteenth round of the Spanish La Liga. Both teams are in awesome form, equal on points and five clear from third place Real Madrid. Whoever wins this match will finish the first half of the season on top. With Lionel Messi making his return from injury and banging two goals in less than 30 minutes of playing time vs. Getafe on Wednesday, the already impressive Barcelona seem to be reaching for new heights. Alexis Sanchez scored three last weekend in a 4-0 victory vs. Elche, while Pedro also scored a hat-trick in a 2-5 win vs. Getafe just before the holidays. Atletico Madrid are unbeaten in their last sixteen games across all competitions. Thibaut Courtois has been amazing on goal for the team, while Diego Costa, who is the league's second leading scorer behind Cristiano Ronaldo, has been filling the headlines all season long. A lot of attention has been focused lately on Atletico's star midfielder Koke as well. Diego Simeone's Atletico Madrid are the real deal this season and a serious contender for trophies. Barcelona are the favourites to win this match. A 100 € bet on Barca could return 120 € in profit, while the same bet on the hosts could return 210 € in profit. The two teams have already met at the start of the season in the Spanish Super Cup final. After two draws (1-1 and 0-0), Barcelona won the trophy on away goals. The most likely score on Saturday, according to the odds, is a 1-1 draw, offered at 11/2. Lionel Messi is the favourite to score at 20/21, followed by Diego Costa who is valued at 1/1. The odds of Neymar scoring are 5/4, while David Villa is at 6/4. Can Atletico continue to stir up the Spanish football order by taking all three points from Barca? The kick-off is at 8pm local time!